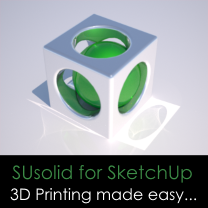 SuSolid is an extension for SketchUp that can help you prepare the model for 3D Printing. It is divided in 4 sections : Solid Check section that shows you all the causes that makes your model a non solid. Solid Repair section that helps you to repair your model and makes it solid. Solid Intersection Check section that shows you all the intersection between solids. Solid Weight section that shows you the weight of the model and every singe component.